We came to the kgotla, our home for the next two nights. A kgotla (the pronunciation inexplicably sounds more like hotler) is a tribal law court and public meeting place; this one had been the court for a village that had been here before the Game Reserve was founded. 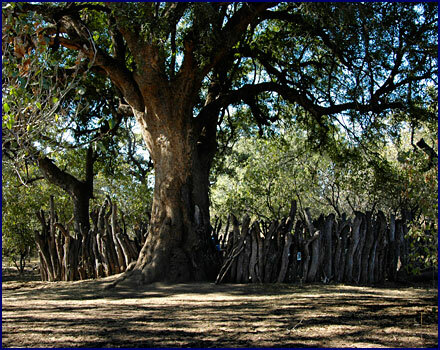 It was a circular boma made of upright posts from a leadwood tree; the wood from this tree is so dense and heavy that it does not float. There was a campfire in the center of the circle, and the dining table and chairs were set up near the entrance. 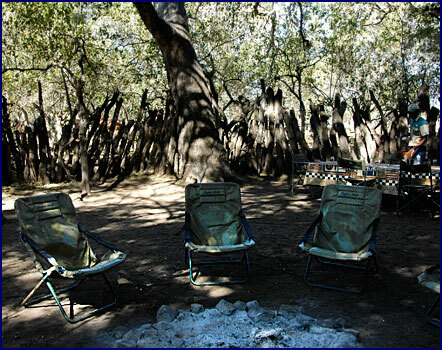 Our beds were positioned around the fire, just inside of the high circular fence, and our bags were beside them. 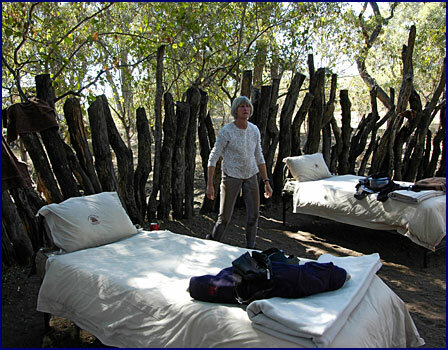 We were to sleep in the open here, without tents, under the canopy of a towering mashatu tree. There was a narrow path with high leadwood walls that led to a toilet and shower, complete with running water. The horses were tied among the trees outside of the kgotla, and the beds for the staff were nearby. Saskia had told us that the kgotla was her favorite spot on the earth, and being here, I could see why. This place had an almost magical feel to it. I found a huge fluffy white ostrich feather beside my bed; surely an omen of good luck. 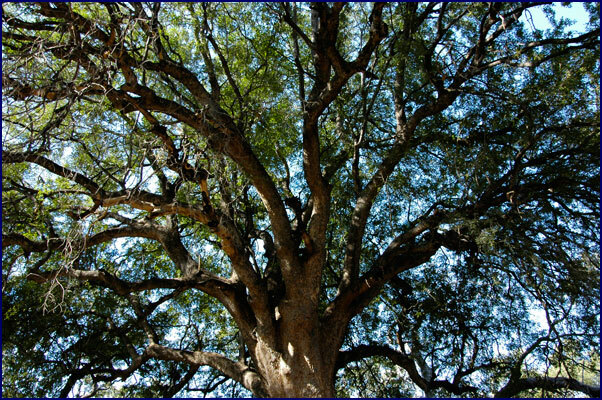 Flopping down on my bed, I looked up at the spreading branches of the mashatu tree above me. It was full of life, and we contentedly watched the birds among the branches and the squirrels running up and down the trunk. It was the best view I have ever had from a bed. 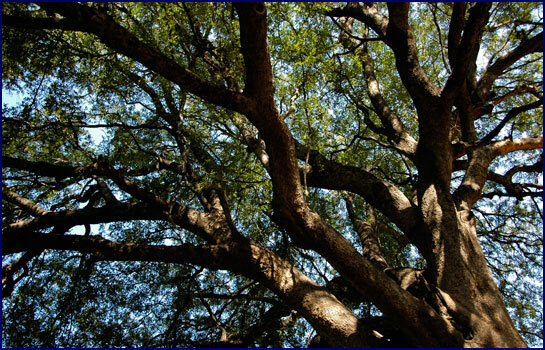 We had lunch beneath the tree, enjoying the beautiful surroundings and excellent company. Between us Americans, the French family (Pierre, Chantal and Pauline), Saskia from Germany, and West and Mooshi from Botswana, it was quite an international group. We told jokes around the lunch table, some of them slightly off color and at the expense of others � good humor definitely superseded the language barriers. Suddenly we heard a loud squawk from above, and an unwelcoming parrot-like voice directed us, �Go Away!� Looking up, we could see a large grey bird, somewhat like a cockatiel, observing us from the top of a dead tree. �Go Away!� he chided us again clearly, in nasal tones of disgust. 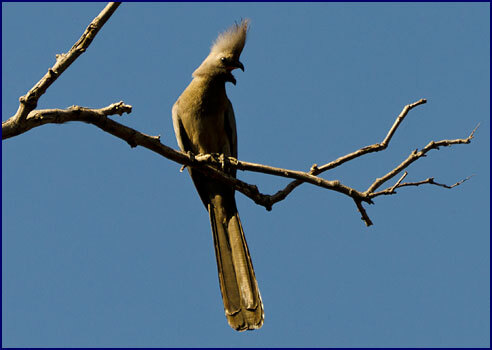 He was, of course, a go-away bird, also known as a grey lourie. We had seen them before, but this was the first time we had heard their signature command. We gathered for tea at four o'clock, and then West took us for an evening game drive. We had no sturdy Landrover or well-appointed Landcruiser this time; instead we all piled into the back of a small, old, battered pickup truck that had definitely seen better days. There were no seats, but we all perched precariously on the wheelwells, the tail gate and the spare tire. I tried sitting on the side of the truck�s bed, but quickly abandoned this perch when we hit a bump and a jagged metal edge ripped both my jeans and the skin on my thigh. After that I stood up behind the cab, clinging on to the roll bar for dear life as West drove across the bumpy ground. We saw many of the usual animals: Impala, kudus, elands, warthogs and a pair of kori bustards. We noticed more lion tracks in the dusty roadway, quite close to camp. We came across a young bull elephant, and watched him until he moved away to join his herd down by a river. We crossed a pitted floodplain to get closer, almost getting stuck several times as we drove through huge ruts and deep elephant footprints that were made when the ground was mud, but were now hardened to brick. I clutched the roll bar as the little truck lurched through the craters left by the elephants� passing, trying to avoid getting my fingers mashed between the bouncing roll bar and the back of the cab. 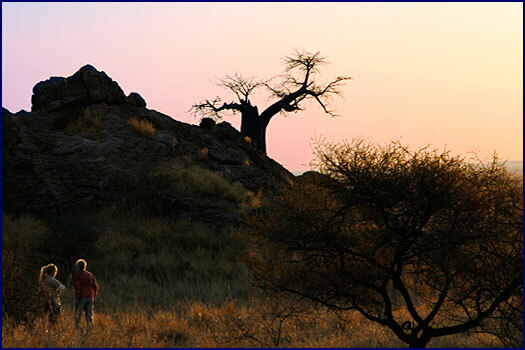 West parked the truck at the base of a huge granite kopje rising abruptly out of the plain. 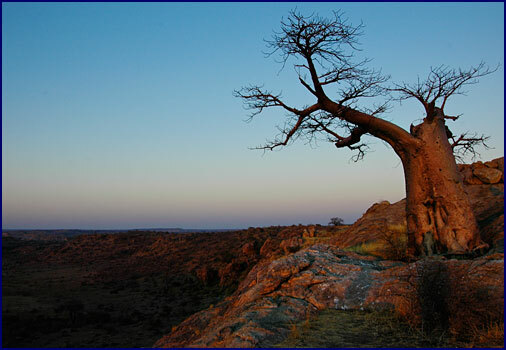 We climbed up the steep path to the top of the outcropping, where a weathered baobab stood on the crown of the hill. We watched as the sun slipped below the horizon, turning the sky to orange and rose. The vista from the top was incredible; we could see for miles. West told us that this kopje was called Mmamagwa Hill. We gazed at the ancient silhouette of the baobab, standing broken but proud, bereft of many branches. What had that tree seen? What hardships had it endured? We sat on the top of the world and had Sundowners, sipping white wine and eating campfire-cooked potato chips. The crystal sky was filled with reflected color, the deep blue blending to gold, orange and magenta, stretching all the way around the horizon. We sat quietly, filling ourselves with the peace of the evening. An elephant shrew joined us, searching for bits of potato chip among the rocks. West showed us where Cecil John Rhodes, founder of Rhodesia (now Zimbabwe), had carved his initials in the baobab tree in 1895. I could have stayed on that high rocky spot forever, but time blew by like the wind, and all too soon it was time to head down. 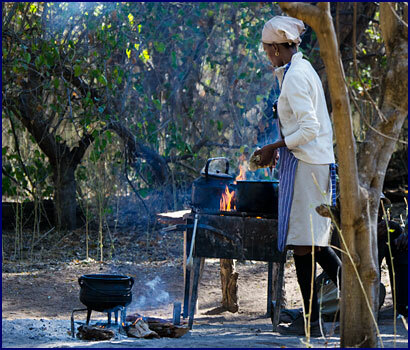 Back at the kgotla, we had an excellent dinner, all camp-cooked on the fire, courtesy of Grace and Martha. Afterwards we sat in folding chairs around the fire. Good food, good company, and stories around the campfire; what could be better? We could hear the faint call of lions in the distance. As the temperature dropped, we moved closer to the fire. We heard the lions again, nearer this time, an eerie primal sound � a combination of roars, moans, and low-pitched grunts. They were answered faintly by others in the distance. West told us that the lion�s roars can carry for up to five kilometers, and they communicate this way to call members of the pride together. Soon the roars were repeated, and the second set of lions sounded much closer. We listed to them calling at intervals, moving nearer each time. I thought of the paw prints we had seen in the dust, just outside the camp. I asked West to tell us the scariest lion stories he knew, but he refused � he said he would tell us those stories later, after we had left the kgotla. Earlier in the evening while at Mmamagwa Hill he had told me about a lion eating a staff member at one of the camps, but he would not now recount the story to the group. Suddenly a thunderous roar split the night � the lions were now extremely close. Hearing them was exhilarating. The guides assured us that even though a lion could easily jump the rough leadwood wall into the enclosure, they probably wouldn�t. The night was filled with the roaring of the lions. Saskia said that they often sound closer than they are; we hoped so, because they sounded like they were right outside the fence! We were not afraid for ourselves, but we did worry for the horses on the picket line outside. Saskia told us that there have been several times at the kgotla when lions have come for the horses, and they have had to chase them off with bullwhips and flaming branches. There would be little sleep for the guides tonight! Saskia said that if all hell breaks loose in the night, no matter what happens and what we hear, we were not to try to help, and not to leave the enclosure. She reiterated that the guides could do their job of protecting the horses much better if they didn�t have to worry about the safety of the guests. Eventually the lions seemed to settle down, and it was time for bed. I lay awake a long time, looking up at the stars through the branches of the mashatu tree and listening to the sounds of the animals in the night. We could hear the soft whoop, whoop of hyenas calling, and we were serenaded by the rising-pitched wheet, wheet, wheet whistle of a pearl-spotted owl. The lions roared at intervals through the night. Later on elephants came close to camp, and some of them sounded angry. At one point we heard a sharp noise like the crack of a whip; it was an elephant breaking branches just outside the fence. We could hear the high pitched cries of the jackals, rising in a chorus each time the lions roared. Listening to the lions in the night is one of my abiding memories of Africa. In the morning we got to sleep in � our wakeup call wasn�t until six. Saskia told us that she had slept on top of the horse truck because of the lions. The elephant we had heard breaking branches in the night had been so close to where she was sleeping that she had been afraid he would reach her with his trunk. There were elephant prints all around the truck, and lion tracks within fifty yards of the guides� beds, which were outside of the kgotla near the horses. We rode out of camp at seven. In the trees near camp we saw a bush pig; it is quite rare to see these elusive creatures. They are sleeker and prettier than warthogs, with long slender noses, soft reddish-brown coats and fluffy grey manes. 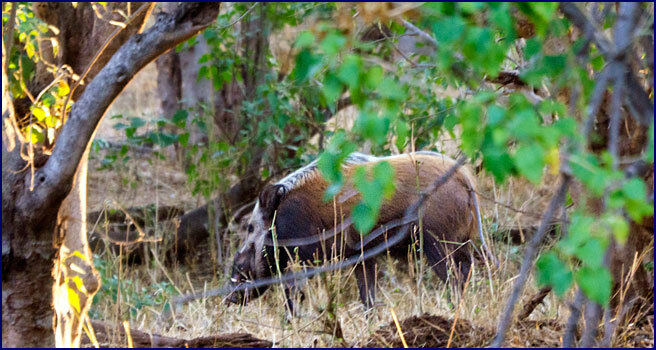 Saskia told us that bush pigs are crepuscular (which she said is her favorite word); active only at dawn and dusk. We rode back past the double rock formations of Mapungubwe Hill. A baboon stood like a sentinel on the top, watching us as we rode slowly by, perhaps guarding the ancient burial grounds. We had a brief glimpse of a group of zebras before they took off, and saw four jackals on an early morning hunt. We had a couple of nice long hand-gallops, and I was pleased to find that Lancelot�s cough was much better this morning. At one point we unexpectedly cantered up behind a group of elephants - we had barely a glimpse of them before they took off. We rode down to the Motloutse River, which only flows for a few days a year, after heavy rains. We crossed the wide dry expanse of sand, following a path of elephant footprints. A steep rock wall thirty meters high stretched halfway across the riverbed; West told us it is called Solomon�s Wall. At one time it reached all the way across, damming the river and creating a waterfall, but centuries of erosion have reduced it. We stood the horses in front of the wall and took group photos. We stopped on the far shore for morning break, with the usual cheese biscuit for us and apples for the horses. We collected guinea fowl feathers among the trees, and watched raptors soar high overhead. We had a long canter on the way home. Pauline had a good camera, and was trying to take photographs of her parents while riding. She kept veering out of line to gallop beside the group, positioning herself to get shots of the moving horses. We arrived back at the kgotla around noon; it was our shortest day riding, just four and a half hours. We had a leisurely lunch, once again accompanied by the go-away bird; he did not welcome our presence and suggested we leave. We could hear elephants nearby. I walked around outside the camp taking photographs, but remembering the lion tracks, I was careful not to stray too far. Pauline showed me her photographs � some of her galloping shots had turned out surprisingly good. I was inspired to give this action photography a try. I lay on my bed, watching the life in the Mashatu tree. Birds, bees and squirrels all vied for the fruit that hung from the branches. 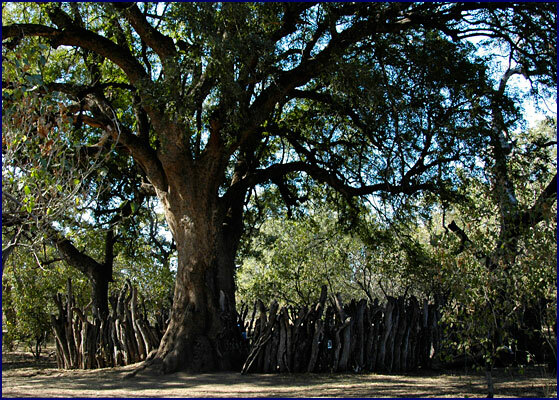 The tree was over 500 years old � I loved to imagine the things it must have seen. How much had the world changed during its lifetime? Less here than elsewhere, no doubt. West took us out again in the little pickup truck for an evening drive. Once again we rode in the back, clinging to the roll bar and jouncing around in the truck bed. 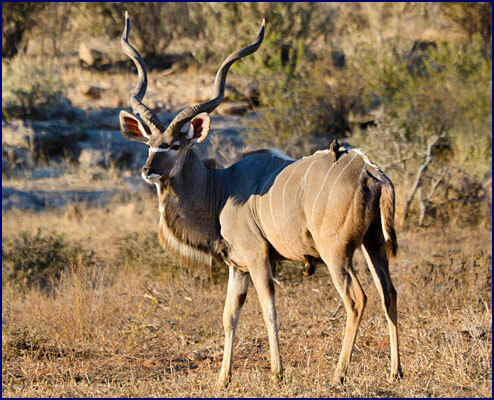 A herd of kudus stood on a small knoll, and a huge bull posed for us, showing off an impressive set of twisting horns. An oxpecker perched on his back and another hung under his belly; these birds have a symbiotic relationship with large mammals, picking off the ticks and other parasites of their hosts. We passed a pair of bat-eared foxes; they are very cute, with petite faces and enormous ears. They vanished quickly when we stopped to watch them. We found it amazing that even after nearly two weeks in the bush we still saw at least one new species each day. West parked by a large kopje with a huge hollow baobab at the base. A mother elephant with her baby were there, but they moved off when we approached. We followed a precipitous path up the side of the granite outcropping; in places it was treacherously steep. We climbed carefully, using narrow crevices for handholds, my old fear of heights kicking in. The view from the summit was spectacular. We stood at the top of a sheer rocky cliff, high above the plain, looking down at the wide dry river stretched below us. Rocky ridges stood in layers beyond it, fading into the distance. We could see forever. There were elephants everywhere, in all directions. A small herd crossed the river to our left, and more moved across the savannah below. The mother and baby we had seen earlier were hanging out around the base of the kopje. We counted fifty elephants that we could see at one time. Looking out to the right, we watched a herd of wildebeests crossing the riverbed. A swarm of mongoose went across the sandy flat, flowing over the ground like a wave. We sat on the rocks and watched the sun setting over the dry river, painting the sky in shades of pink. It was a lovely feeling, sitting there with the world at our feet. An elephant shrew joined us for Sundowners, wiggling its long trunk-like nose and rummaging for dropped bits of popcorn. Pauline climbed far out on a rock ledge that jutted into space, making me nervous on her behalf. I didn't go close to the edge myself � getting back down the steep path in the half-darkness was challenging enough! Once again we sat around the fire after dinner, enjoying the companionship of the group. I asked West to tell us about the scariest thing that had ever happened to him on safari, but he denied having had any close calls. Instead he told us about a man who had been crossing the Limpopo River at the Pont Drift border in a canoe because the water level was too high to use the cable car. He had dangled his hand in the water, and a huge crocodile grabbed it, pulled him into the river, and ate him. What a way to go! I think I would rather be eaten by lions. We went to bed, listening to the night sounds. 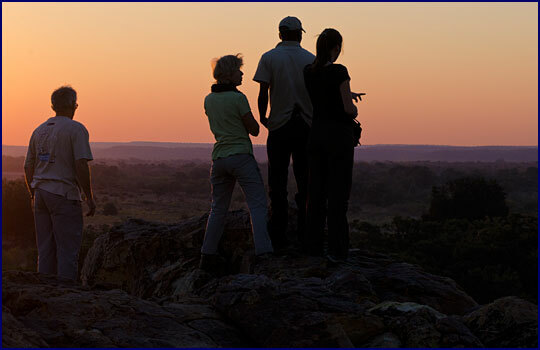 We heard bat-eared foxes, jackals and hyenas � but no lions. No crocodiles, either. Slowly the velvet African night enfolded us, and we drifted off into sleep.